The Advocate has learned that concurrent meetings took place Monday morning at the White House and on Capitol Hill that could help clear the way for “don’t ask, don’t tell” repeal to be attached to the Department of Defense authorization bill later this week. LGBT groups met with officials at the White House while legislative affairs representatives from the White House and the Department of Defense met with the staff of House and Senate leadership offices on Capitol Hill along with those of Rep. Patrick Murphy and senators Carl Levin and Joseph Lieberman. A White House aide who spoke on the condition of anonymity confirmed the White House meeting. “Our understanding is that Congress is determined to act this week and we are learning more about their proposal now,” said the aide. A Democratic leadership aide called the development “promising” but said discussions were ongoing. The House Democratic leadership is expected to meet to discuss the proposal later this afternoon. President Obama has signed on to a “don’t ask, don’t tell” compromise between lawmakers and the Defense Department that is likely to clear the way for repeal of the 17-year-old ban on the military’s policy banning gays and lesbians from serving openly in the armed forces. Under the compromise, worked out in a series of meetings Monday at the White House and on Capitol Hill, lawmakers will proceed to repeal the Clinton-era policy in the next several days, but the repeal will not go into effect until a Pentagon study about how to implement it is completed. Gay rights advocates hailed the White House decision as a “dramatic breaktrhough” that they predicted would dismantle the policy once and for all. The Senate Armed Services Committee is set to vote Thursday on adding a repeal to the defense authorization bill. Committee Chairman Carl M. Levin (D-Mich.) favors a repeal, but at least six senators on the panel are considered undecided. The House may also vote on a similar measure this week by Rep. Patrick J. Murphy (D-Pa.). House Armed Services Committee Chairman Ike Skelton (D-Mo.) declined to include Murphy’s bill in passing the House version of the defense spending measure last week, but Speaker Nancy Pelosi (D-Calif.) has said she will allow a floor vote if there is enough support in favor of a repeal. Congressional aides said it’s unclear whether Murphy has the votes necessary to pass his bill. Any repeal would take effect only after President Obama, Defense Secretary Robert Gates and Joint Chiefs of Staff Chairman Adm. Mike Mullen review the Pentagon study and certify that the new law can be implemented without a negative impact on military readiness, recruitment and retention, according to the sources. The repeal is limited in one sense. 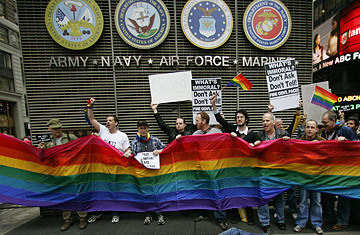 It does not ban discimination against gays in the militery. It returns the status quo ante DADT in 1993 when the president had sole authority to set military personnel policies on gays. The difference is that now the president has promised to reverse the old policy after a study is issued in December on how to implement the change. In theory, the next president could reassert the ban. But that’s very unlikely to happen once gays are serving openly. Liberalization of anti-gay public policy tends to be governed by one-way ratchet. Plus, the experience in other countries has been that allowing service by openly gay personnel presents no real problems for recruitment, retention, or discipline, and controversy about it quickly subsides. While some see lots of holes in the compromise, most LGBT and progressive groups are responding favorably. “The White House announcement is a dramatic breakthrough in dismantling ‘Don’t Ask, Don’t Tell.’ The path forward crafted by the President, Department of Defense officials, and repeal leaders on Capitol Hill respects the ongoing work by the Pentagon on how to implement open service and allows for a vote this week. President Obama’s support and Secretary Gates’ buy-in should insure a winning vote, but we are not there yet. The votes still need to be worked and counted. If enacted this welcomed compromise will create a process for the President and the Pentagon to implement a new policy for lesbian and gay service members to serve our country openly, hopefully within a matter of a few months. This builds upon the support Defense Secretary Robert Gates and Admiral Michael Mullen, Chairman of the Joint Chiefs of Staff, expressed for open service during the February hearing in the Senate, and further underscores that this Administration is committed to open service.”The full language of the DADT repeal legislation can be found at AmericaBlog Gay. Advocacy groups appear to be pleased with the agreement, though one could obviously see pitfalls. A Pentagon ruled by those with a different ideological perspective could overturn the new open service policy, if they have the authority to do so. But this would be arguably less likely (or at least as likely) than a future Republican Congress, which would probably waste no time attempting to ban openly gay service. Once the new policy is in place, new restrictions become a harder sell. All of this is apparently predicated on getting the necessary votes in the Senate Armed Services Committee (Three of these five swing votes – Robert Byrd, Bill Nelson, Evan Bayh, Jim Webb, Scott Brown – would be necessary for passage). If that is handled, then the House would adopt similar language, probably through an amendment to the defense authorization bill which the House Armed Services Committee completed work on last week. Once repeal is embedded in the defense authorization bill, it would take 60 votes in the Senate to remove it, and opponents don’t have that. It’s puzzling that it took this long for a deal like this to be struck. This is basically what Carl Levin has been offering for months – repeal with a delayed implementation. Perhaps the White House realized the damage they would incur if they did not push repeal after announcing it with great fanfare in the State of the Union address. The other complicating factor here is that Robert Gates has recommended a veto of this defense bill for totally different reasons. He feels that it consists of too many unwanted military spending projects. It’s unclear how the President would handle the delicate topic of vetoing a bill with a major gay rights initiative and explaining that there were different reasons for the veto. Any guesses as to why the left is eager to do this now instead of waiting until December for the Pentagon to finish its review? The impetus for the meetings is a push in Congress, which passed the measure under President Bill Clinton, to add a repeal of the policy to the upcoming defense authorization bill. The only thing that might stop it at this point is if Carl Levin can’t get 15 votes to attach the repeal to the appropriations bill. CBS says he’s a vote or two short, but several committee members on the fence. And who are those members? On the GOP side, you’ve got Graham, Scott Brown, and Susan Collins, any or all of whom should be ripe for the picking. (McCain, the committee ranking member, will surely vote no to keep Hayworth at bay.) I’m fascinated to see how many Republican votes are going to pop for this in the general floor vote, especially since Gates and Mike Mullen have endorsed repeal and doubly especially since it’s unclear how much tea partiers will care about a social issue as hot-button as this. A group of military officers from U.S. ally nations told the Brookings Institute last week that they had no trouble integrating gays openly into their armed forces. Expect that talking point to figure prominently if this blows up in a couple of days. Exit question: Is it time? It’ll be interesting to see how this plays out. While homosexuality has been normalized enough that we have a president, SECDEF, Joint Chiefs chairman, and probably a majority in Congress willing to go on the record to support gays serving in the military — something that decidedly wasn’t the case when Bill Clinton took office in 1993 — it’s still a hot button issue in much of the country. Referenda to ban gay marriage, for example, seem almost always to pass easily. Will Republicans mount a filibuster on this issue? I doubt it. And it’s going to be very difficult to mount a credible argument opposing lifting the ban once the Pentagon certifies — which it almost certainly will — that doing so will not harm morale or be prejudicial to good order and discipline in the military. My major fear up to now has been that the repeal could get lost legislatively if the GOP made big gains in the House and Senate this fall, as is historically almost certain. This compromise removes the basis for that fear, while allowing the military and the defense secretary to manage the transition to ensure a smooth ride. I hope it works. If it does, it really will be a feather in the cap of Jim Messina, the good folks at SLDN and Servicemembers United, and the Obama administration. It will also redound to the credit of those who did not give up on this, who refused to concede that this was not a civil rights question of the first order, and to the countless servicemembers, past and future, who put their lives and careers on the line for this change. It’s been a long two decades. So long one almost feels numb at exactly the moment one should feel exhilarated. But that’s probably how all such breakthroughs feel, when they eventually happen. For the first time in American history, gay people will be deemed fully worthy of the highest call of patriotism – to risk one’s life for the defense of one’s country. “I am keeping an open mind, but I do not support moving ahead until I am able to finish my review, the Pentagon completes its study, and we can be assured that a new policy can be implemented without jeopardizing the mission of our military,” Brown said in a statement provided to the Globe. Brown, who is also a lieutentant colonel in the Massachusetts National Guard, said he came to his decision after hearing the views of multiple officers and enlisted personnel. But the AP reports that Senator Susan Collins will vote in favor of repeal. There are 28 senators on the Armed Services Committee (16 Democrats and 14 Republicans). So, if Collins supports repeal and all other Republicans oppose it (which seems likely), the Democrats can afford two “no” votes and and still pass it out of committee with 15 votes. Jim Webb, Ben Nelson, and Robert Byrd seem like potential Democratic “no” votes, but we’ll just have to wait and see how it all works out on Thursday. This is actually not much of a compromise. It’s basically a complete win the DADT repeal forces, since implementation always would have taken some time no matter when repeal was passed. Pelosi and Reid already support repeal, and now, with Obama’s active support, the chances of getting it through Congress are excellent. Adam Weinstein has more here. So if things go the way I think they’ll go, by later this year Obama, Pelosi, and Reid will have passed a historic stimulus bill, the Lily Ledbetter Act, healthcare reform, college loan reform, financial reform, repeal of DADT, and Obama will have withdrawn from Iraq.1 Not bad for 18 months of work. And who knows? There’s even a chance that Obama’s Afghanistan escalation will work. If it does, what president since LBJ will have accomplished more in his first term? 1Except for the pesky “residual force,” of course. Still, once the combat forces are gone, it’s hard to see a scenario in which they’re ever sent back in.